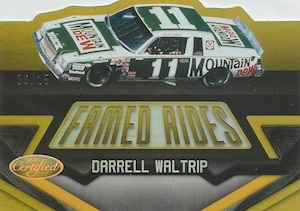 A common brand in the Panini arsenal, 2016 Panini Certified NASCAR Racing offers cardboard rarity in both blaster and hobby format. Blasters promise one hit while Hobby boxes include two autographs and two memorabilia cards. 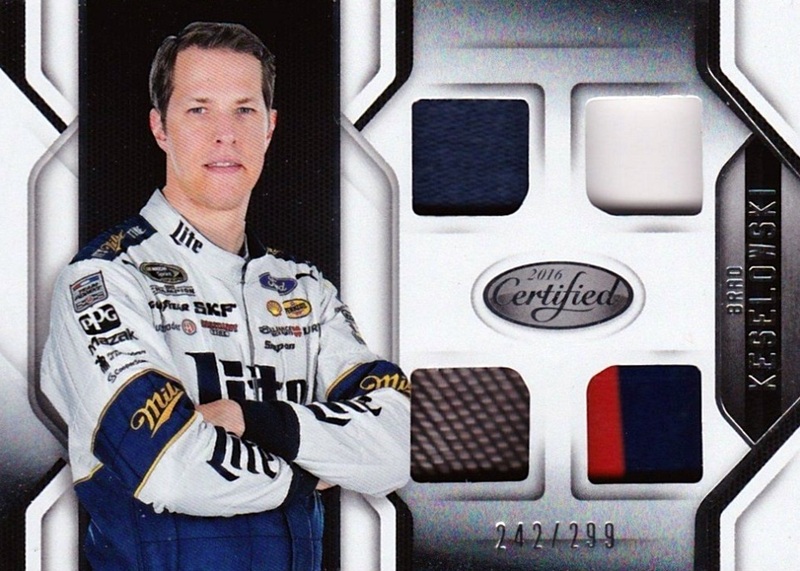 In addition to the base set, 2016 Panini Certified NASCAR Racing takes things into the fast lane with multiple inserts and hit choices that are all numbered. Chiefly among these are Freshman Fabrics (#/199 or less) which highlight the rookies of the Sprint Cup with autographs and a relic piece from a firesuit. 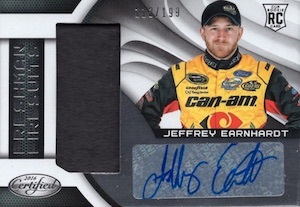 Gold Team Signatures (#/50) focus on the very elite of the racing world. Additional autograph options include Certified Signatures (#/199 or less), Certified Potential Signatures (#/199 or less) and Sprint Cup Signature Swatches (#/199 or less). 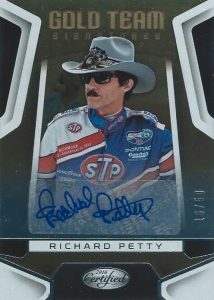 Memorabilia cards in 2016 Panini Certified NASCAR Racing present collectors with added relic variety. This includes multi-relic Complete Materials (#/199 or less) that contain relic pieces from firesuits, gloves, sheet metal, shoes, or tires. 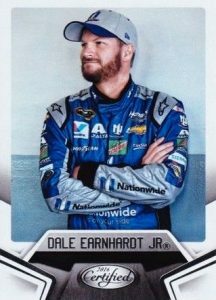 2016 Panini Certified NASCAR Racing also has traditional inserts which are numbered to 199 or less. 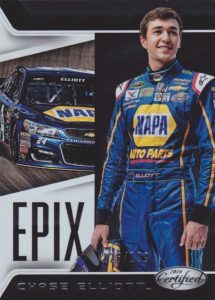 Epix features top drivers, Spills looks to notable talent, and Famed Rides opts for the cars themselves. Taking each set another step further, every hit or insert numbered to 199 or less is also treated to multiple parallels with Mirror Red (#/75 or less), Mirror Blue (#/50 or less), Mirror Gold (#/25 or less), Mirror Purple (#/10 or less), Mirror Green (#/5 or less) and Mirror Black (1/1). Gold Signatures is the lone exception with only Mirror Gold (#/25) and Mirror Black (1/1) parallels. 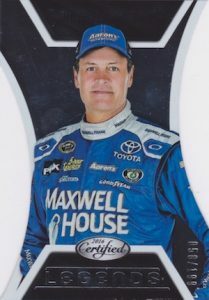 2016 Panini Certified NASCAR Racing is one of four options in the debut season for the card maker's new racing line. 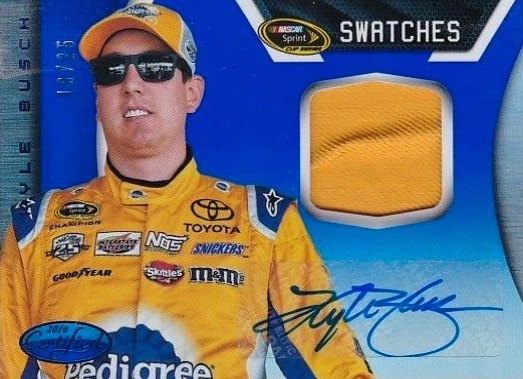 UPDATE: While hard-signed content was originally the plan, on-card autographs will not be found in 2016 Panini Certified NASCAR Racing. 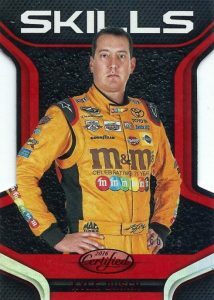 Panini explained the decision, saying, "Due to challenges associated with acquiring autographs during NASCAR's Chase for the Cup, Panini America has made the difficult decision to remove the 'on-card' autograph elements from 2016 Certified Racing and convert them into sticker autographs." PARALLEL CARDS: Mirror Orange #/99, Mirror Silver #/99, Mirror Red #/75, Mirror Blue #/50, Mirror Gold #/25, Mirror Purple #/10, Mirror Green #/5, Mirror Black 1/1. PARALLEL CARDS: Mirror Red #/75 or less, Mirror Blue #/50 or less, Mirror Silver #/50 or less, Mirror Orange #/35 or less, Mirror Gold #/25 or #/15, Mirror Purple #/10, Mirror Black 1/1. PARALLEL CARDS: Mirror Orange #/149 or less, Mirror Silver #/99 or less, Mirror Red #/75 or less, Mirror Blue #/50 or less, Mirror Gold #/25 or less, Mirror Purple #/10 or less, Mirror Green #/5 or less, Mirror Black 1/1. PARALLEL CARDS: Mirror Orange #/149 or less, Mirror Red #/99 or less, Mirror Silver #/99 or less, Mirror Blue #/50 or less, Mirror Gold #/25 or less, Mirror Purple #/10 (*Card #1 - #/5), Mirror Green #/5 (*Card #1 - #/3), Mirror Black 1/1. PARALLEL CARDS: Mirror Orange #/99 (*Card #12 - #/5), Mirror Silver #/99 (*Card #12 - #/5), Mirror Red #/75 (*Card #12 - #/25), Mirror Blue #/50 (*Card #12 - #/20), Mirror Gold #/25 (*Card #12 - #/15), Mirror Purple #/10, Mirror Green #/5, Mirror Black 1/1. PARALLEL CARDS: Mirror Orange #/199 (*Card #1 - #/99), Mirror Silver #/199 (*Card #1 - #/99), Mirror Red #/75, Mirror Blue #/50, Mirror Gold #/25, Mirror Purple #/10 (*Card #1 - #/6), Mirror Green #/5 (*Card #1 - #/2), Mirror Black 1/1. PARALLEL CARDS: Mirror Orange #/99, Mirror Silver #/99, Mirror Red #/75, Mirror Blue #/50, Mirror Gold #/25, Mirror Purple #/75, Mirror Green #/5, Mirror Black 1/1. PARALLEL CARDS: Mirror Gold #/15 or less, Mirror Black 1/1. PARALLEL CARDS: Mirror Orange #/199 or less, Mirror Silver #/199 or less, Mirror Red #/75 or less, Mirror Blue #/50 or less, Mirror Gold #/25 or less, Mirror Purple #/10, Mirror Green #/5, Mirror Black 1/1. 15 cards. *Specific print runs for card #5 not provided. PARALLEL CARDS: Mirror Orange #/99 or less, Mirror Silver #/99 or less, Mirror Red #/75 or less, Mirror Blue #/50 or less, Mirror Gold #/25 or less, Mirror Purple #/10 (*Card #8 - #/5), Mirror Green #/5 or #/3, Mirror Black 1/1. PARALLEL CARDS: Mirror Orange #/99 (*Cards #6-9 - #/199), Mirror Silver #/99 (*Cards #6-9 - #/199), Mirror Red #/75, Mirror Blue #/50, Mirror Gold #/25, Mirror Purple #/10, Mirror Green #/5, Mirror Black 1/1. 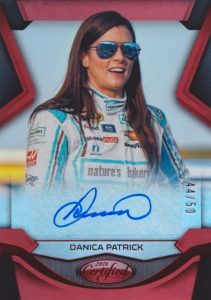 Shop 2016 Panini Certified NASCAR Racing Hobby boxes on eBay. Aden Taylor � There will likely be both formats for Certified but I have not seen anything official for hobby yet. Hey Trey, is there a checklist for this product? This product came out today. Still waiting on it, unfortunately.